This project involves the installation of 250 self-contained bedroom with ensuite facilities in 6 accommodation buildings. There are common lounge rooms and kitchens on each floor. Several rooms equipped for students with disabilities are available. A student Hub will also be provided for social activities, administration and study support and available 24/7. The project is using a modular design process with all modules being manufactured off site and transported to Port Macquarie from Brisbane. 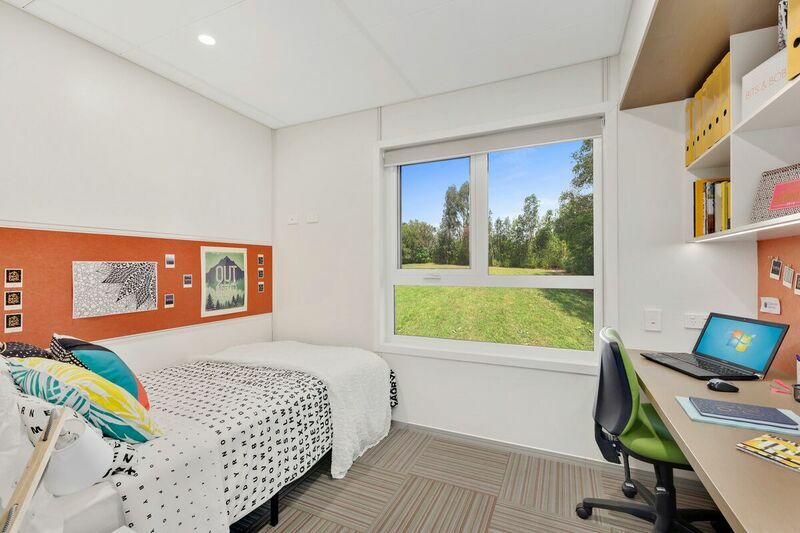 Each room is self-contained and has a study area, an ensuite and storage cupboards. University strength WiFi is available across the site and swipe cards will be used for room access and controlling lights and air-conditioning. The site is disability access compliant and has walking pathways to the main campus and a bus stop. The buildings are modular which is one of the most efficient construction methods available. The access controls system (card) will be used to control the air-conditioning and lights when students are not in their rooms. The site has a series of environmental controls and is subject to an active vegetation management and koala management plan. The project is currently under construction, and at the end of June 2017 will have 2 of the 7 buildings in place. The majority of infrastructure (i.e. roads, storm-water and sewer) are in place. The below video has been produced to showcase the modular development and includes interviews from the key stakeholders involved in the project.